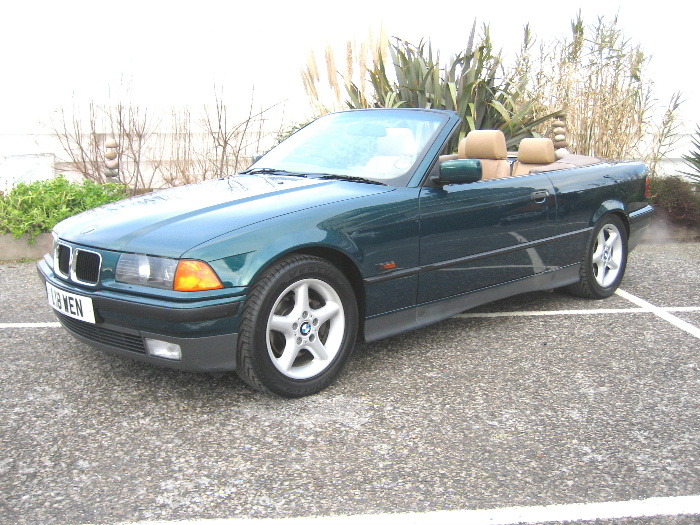 BMW 325i Convertible, 2 Doors, Manual, Convertible, Petrol, 1994 L Reg, 82,000 miles, Metallic Green. Central Door Locking, Front Fog Lights, In Car Entertainment, Power-Assisted Steering, ABS, Adjustable steering column/wheel, Anti theft system, CD Multichanger, Colour coding - Body, Computer, Driver airbag, Electric mirrors, Electric windows, Foglights, Front armrest, Head restraints, Heated seats, Leather upholstery, Locking wheel nuts, Metallic paintwork, Radio/Cassette, Rear headrests, Tinted glass. 17 Alloys,Powerhood,Full Service History,Local Car,Superb.